Those with misdemeanors may now have an alternative to serving jail time. 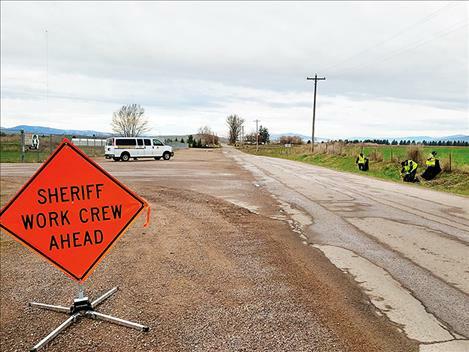 POLSON —The Lake County Sheriff ’s Office recently began a work detail program. The idea is to enable those with misdemeanors to work off the jail portion of their sentences by doing community work. Such projects that have been completed since the program was implemented in early April include: raking and grooming the courthouse lawn downtown, picking up trash along roads and removing stickers from decommissioned LCSO patrol cars. Beautification projects in Polson and Ronan are on the to-do list, Sheriff Don Bell said. He noted more than 800 people have been waiting to serve as few as one day to a week in jail but have been unable to do so because the jail is full. There’s a $25 registration fee plus $25 a day to enroll, but those who voluntarily enroll will get 24 hours of credit for time served for every four hours of work performed. Bell said the sheriff ’s office has been working to get the program going for over a year. He noted that only one other county in the state has such a program. “Folks have been very appreciative to get this off their books,” Bell said. Up until now, those with misdemeanors had to call the jail one to three times a week to see if space was available. Jail time in such misdemeanor cases can come from the county justice court or city courts in Polson, Ronan or St. Ignatius. Another new program allows a person to serve a jail sentence by spending 12 hours overnight in the jail on Friday or Saturday nights. A person can start at 6 p.m. but later times may be available, Bell said. There is no discounted time for this program, which has up to six enrollees spending time in the jail’s recreation room per weekend night. Six portable plastic beds will be used for the program, Bell said. Those interested in either program should stop by the jail and request an information packet. Non-profit organizations that would like to participate in the work detail can call 406-883-7282.